416N, never heard of it! If memory serves the German issued 416 also has some differences. Not unusual for service rifles to be configured differently for various countries. The German Version in the Bundeswehr is the HK416A7 with 14,5’’ barrel or named G95K in Special Forces (KSK+Kampfschwimmer) . 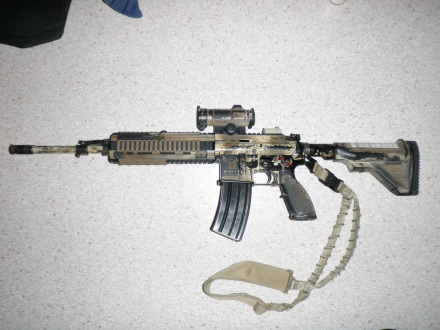 The German ZUZ (Zentrale Unterstützungsgruppe Zoll) (Central Assistance Group Customs) uses the HK416A5 with 11" barrel namd the G38C. They uses different optics as well. Eotech and Aimpoint.